Last weekend I spent some time getting my closet edited and organized for the season ahead. I’d been putting off a proper clean out and wardrobe assessment but now that it’s done I feel like I can really lean into my spring style and have some fun! I’ve talked about seasonal closet prep in the past and I figured if I was due for a refresher, you might enjoy one too. I’ve also been meaning to create a Closet Mission tool for this purpose. 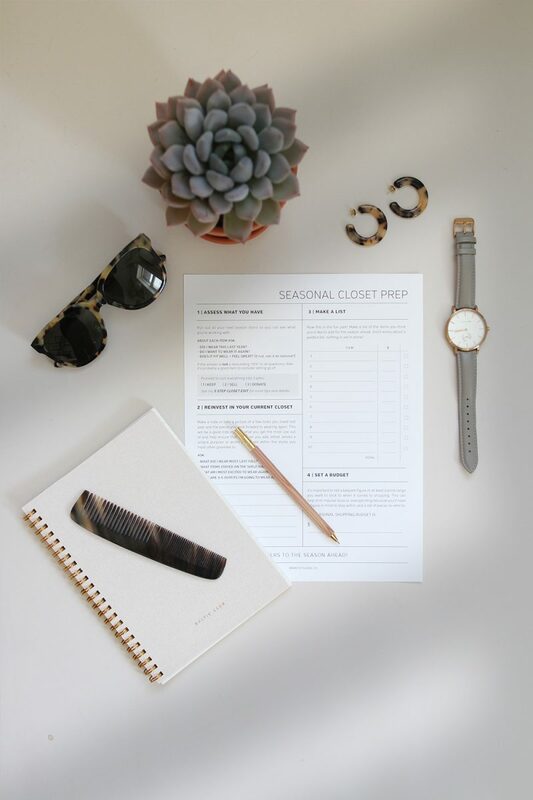 So that’s what today’s post is, my official seasonal closet prep guide! 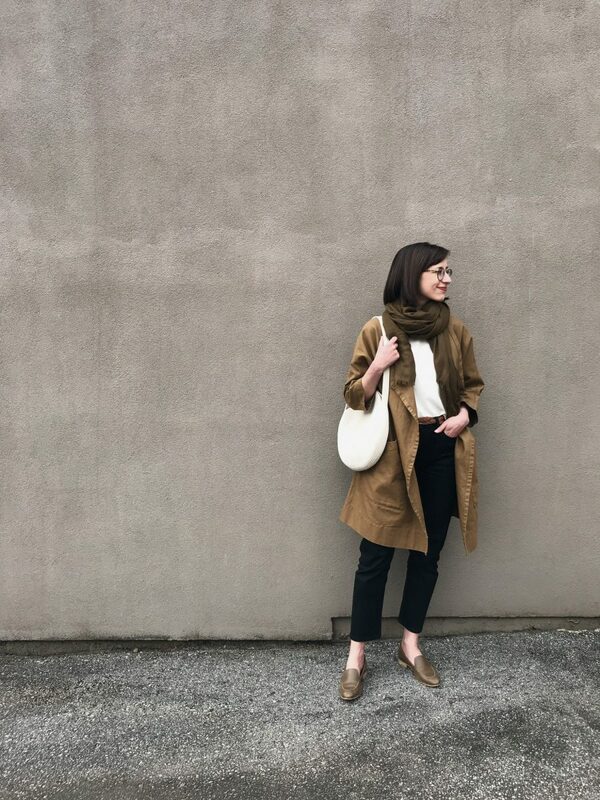 I’ve been using these steps at the start of each season for several years now and it really helps me keep my personal style cohesive, budget in check and builds excitement for the season to come. 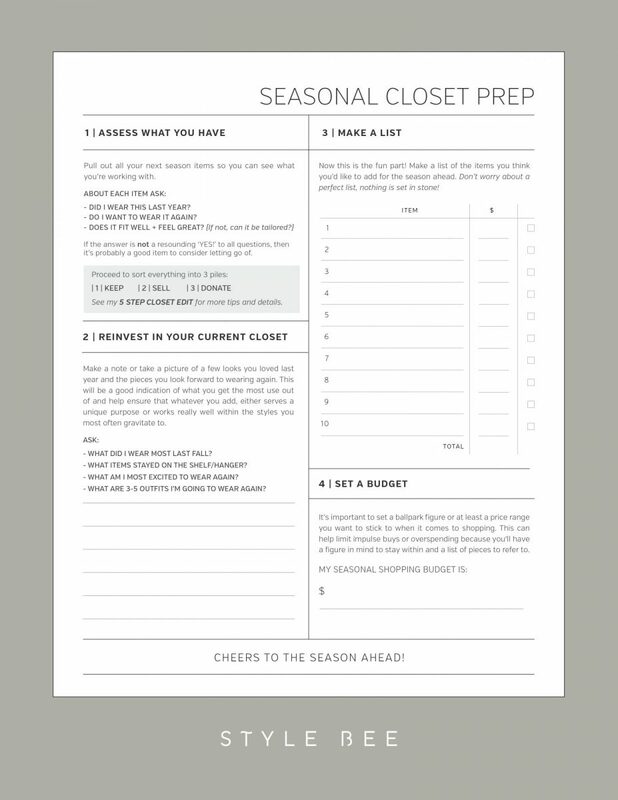 DOWNLOAD THE FREE SEASONAL CLOSET PREP WORKSHEET TODAY! I used to dive head first, or should I say credit card first, into a new season, snapping up trends and pieces without much planning or thought behind it. If I liked an item, it was cheap enough and I could get my hands on it, I’d order it. The thrill was instant but fleeting and by now we all know how that consumption story goes and it’s not a happily ever after scenario. Now, instead of letting my instagram feed or my newsletter subscriptions dictate my choices, I take a much more pragmatic approach to organizing and adding items to my closet. 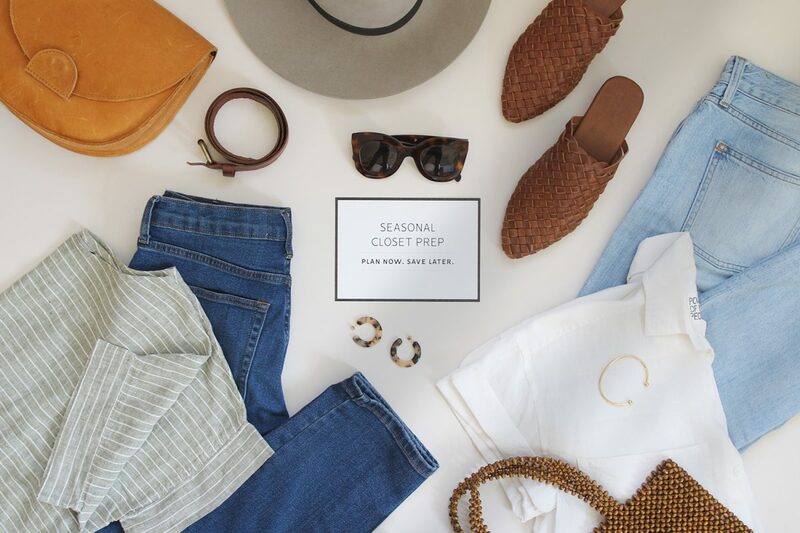 I spend about an hour or so conducting my seasonal closet prep, which helps me assess what I have, edit what isn’t working, reinvest in my wardrobe and plan out any additional items. An hour or so at the start of a season can help you save so much money and closet frustration! So let’s take a look at this 4-step process. It’s no secret that I love a good closet edit. It’s one of my favourite ways to begin a season and after conducting them for several years I can promise it only gets easier. 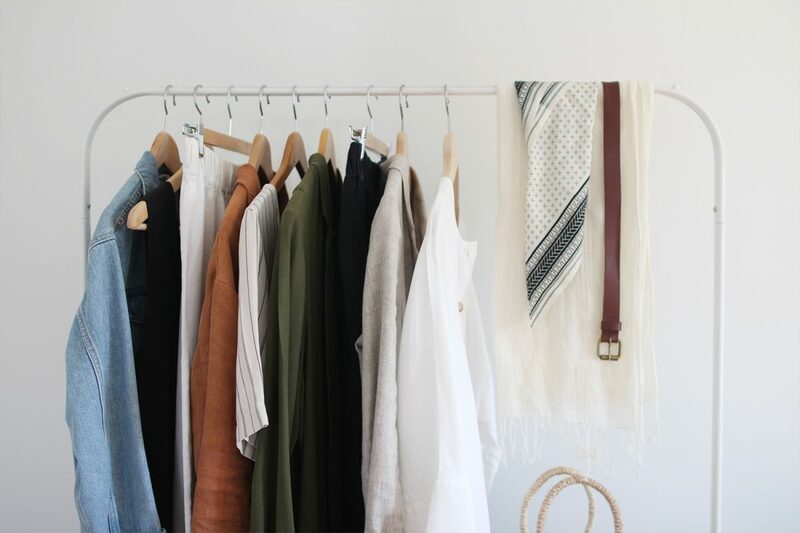 Even if you don’t have the Kondo gene for tidying and organizing, I still think it’s possible to learn to love this exercise, especially after you see how much clarity it brings to your closet and style! 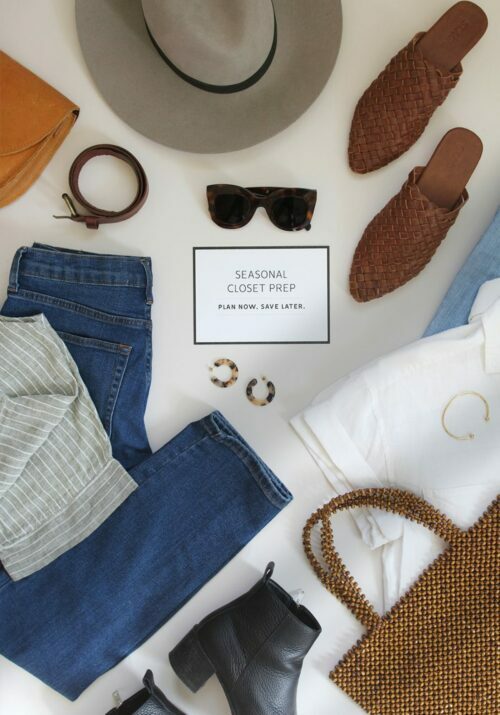 Additionally, if you live in a more temperate climate without significant seasonal changes, it can still be a great way to get organized and give your wardrobe a reboot for a few months. Pull out all your upcoming season items so you can see them. I typically put everything on either my IKEA clothing rack, bed or floor. It’s not pretty but it is very helpful to see everything together to get a sense for colour palette and to quickly identify trends in certain styles. However, if you’re short on space or tend to get overwhelmed, that’s okay! Start with sections like shoes, bottoms, tops or jackets. DID I WEAR THIS PIECE THIS TIME LAST YEAR? WAS IT IN HIGH ROTATION OR MORE OF A ONCE IN A WHILE ITEM? DID I FEEL GOOD WEARING IT? DO I WANT TO WEAR IT AGAIN THIS YEAR? DOES IT FIT WELL AND FEEL COMFORTABLE? It’s a bit more involved than simply asking ‘Does this spark joy?’ but you get the drift. If the answer is not a resounding ‘YES!’ and you can’t tailor a piece to suit you better, then it’s probably a good item to consider letting go of, which is where the next step comes in! This pile is for the items you love and can’t wait to wear again. 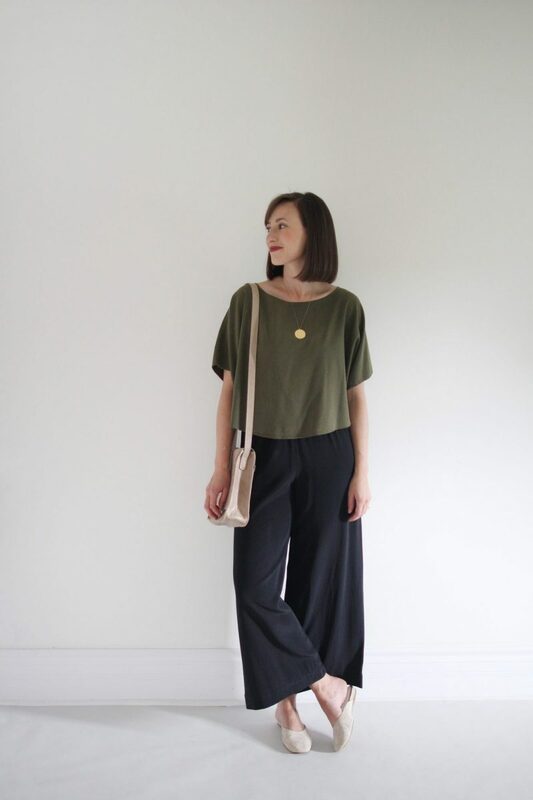 It’s also for pieces that might need some tweaking like a hem adjustment, fit tailoring or repair. This section will be for good quality items, in excellent condition that you’re ready to say goodbye to and plan to take to a consignment shop or post online for resale. These pieces are the ones that aren’t serving you anymore but might not be special enough to consign or sell. Stained or irreparable items should be disposed of accordingly. 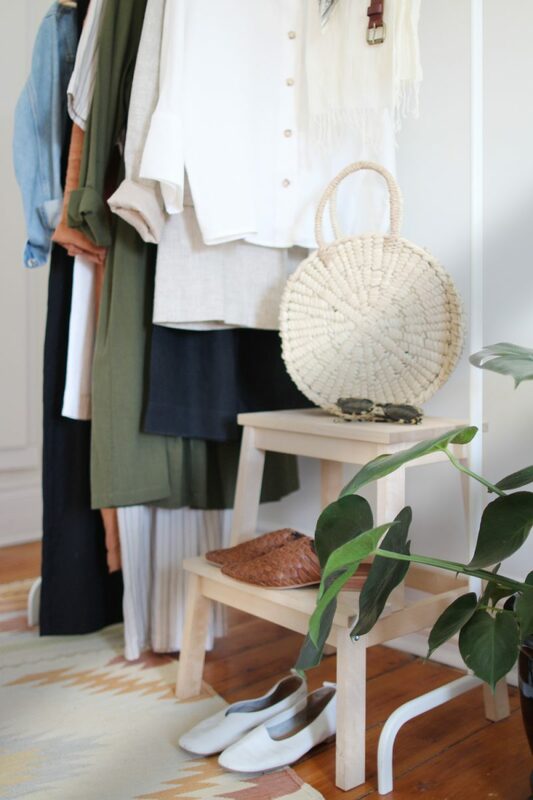 My 5 Step Closet Edit post goes into more detail on the editing process, includes tips on where to resell your good-quality items and demonstrates how I organize and maintain my closet. Plus lots more! Categorize – By item type and colour. Shoes love to hang out with shoes, sweaters with sweaters, hats with hats, coats with coats and pants with, you guessed it, pants! Put Up Barriers – To help limit overflow and maintain order. Whether it’s through baskets, boxes or in-drawer barriers it’s helpful to have a physical delineation between sections and categories. 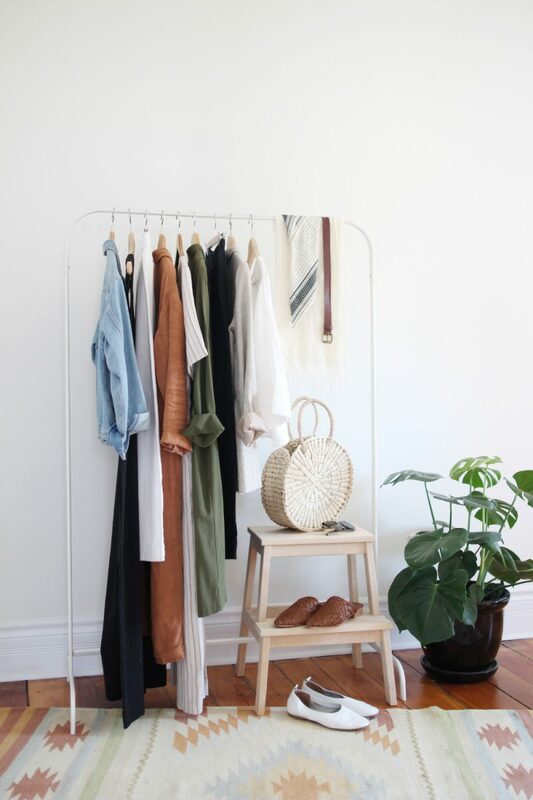 Designate A Spot – Defined locations, even if on a shared shelf, for specific closet categories (ie: sweaters or jeans) makes getting ready so much easier. It also helps you keep much better track of what you have. 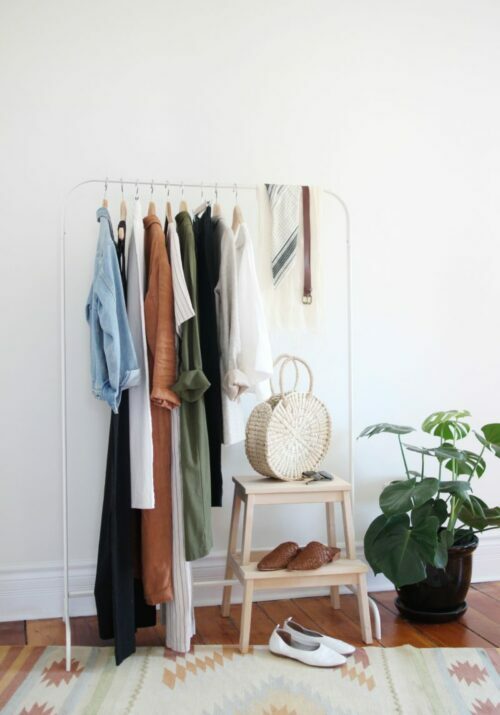 Stow Off-Season Items – A great way to give yourself more closet space is to store clothes that you won’t wear for a few months like sweaters, boots and coats in the summer and light dresses, shorts and sandals during the winter. 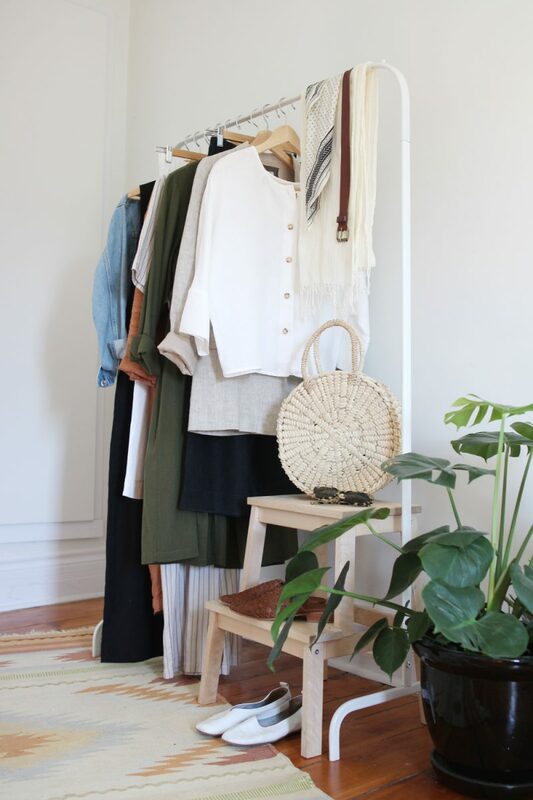 Maintain Visibility – I believe that you wear what you can see more than what you can’t (or have to look for), so if space allows, try to keep your items as visible as possible. I have a standing clothes rack where I keep my most reached for favourites during the season and that has been a huge help. Now this might actually be my favourite part of the whole prep process, reinvesting in the items I have and can’t wait to wear again. This step can really help to curb your shopping cravings too! WHAT DID I WEAR MOST THIS TIME LAST YEAR? WHAT AM I MOST EXCITED TO WEAR AGAIN? WHAT ARE 5-10 OUTFITS I’M GOING TO WEAR AGAIN? Make a mental note or take a picture of a few looks you loved last year and look forward to wearing again. This will be a good indication of what you get the most use out of and highlight some potential looks/silhouettes/uniforms that will help ensure that whatever you add, either serves a unique purpose or works really well within the styles you most often gravitate to. 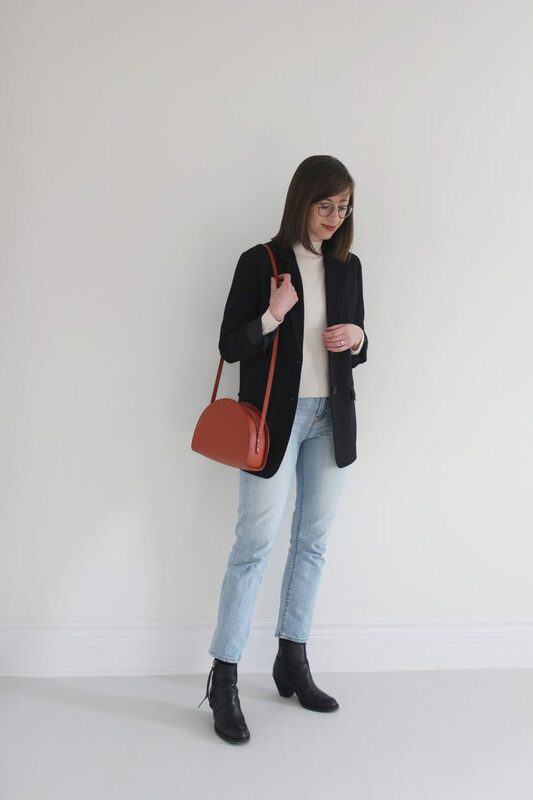 For Example: I loved wearing jumpsuits, blazers and straight-leg denim last spring. 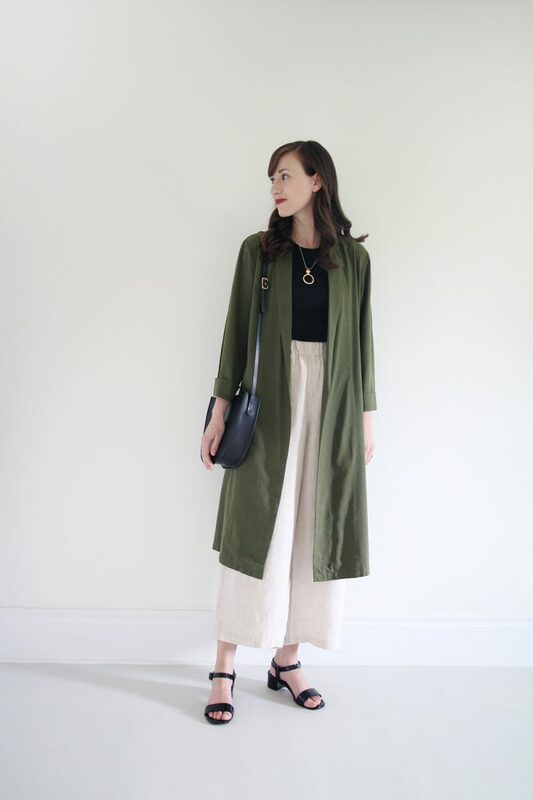 My slides and flats stomped many a street and I’m pretty sure I’ll never tire of my wide-leg pants and duster jackets. THERE ARE ANY GLARING GAPS WITHIN THE SECTION. THERE ARE STILL A FEW PIECES YOU NEED OR WISHED YOU HAD LAST YEAR. 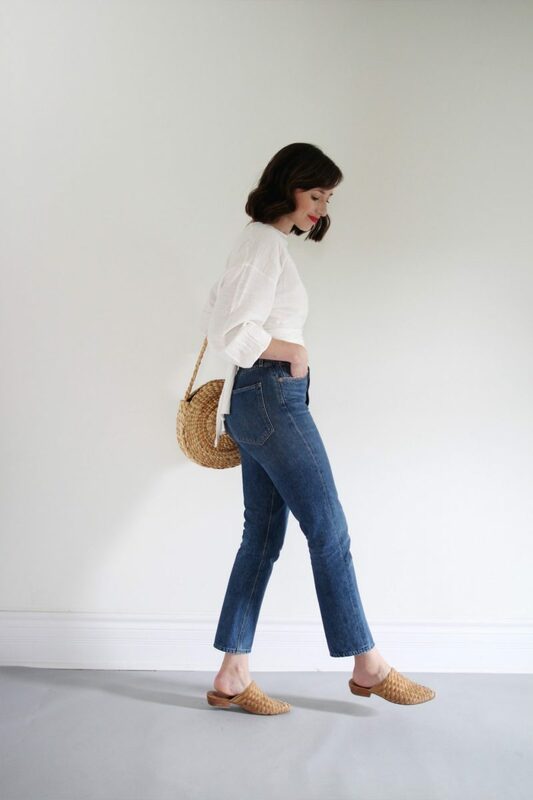 Maybe you only have one pair of flats or your favourite jeans are wearing dangerously thin or you have only one basic tee left after the edit. These are all important things to note so you only add things you can really make use of. So often we add variations of things we already have enough of and end up wearing things even less. Look at what you’re planning to donate or sell. 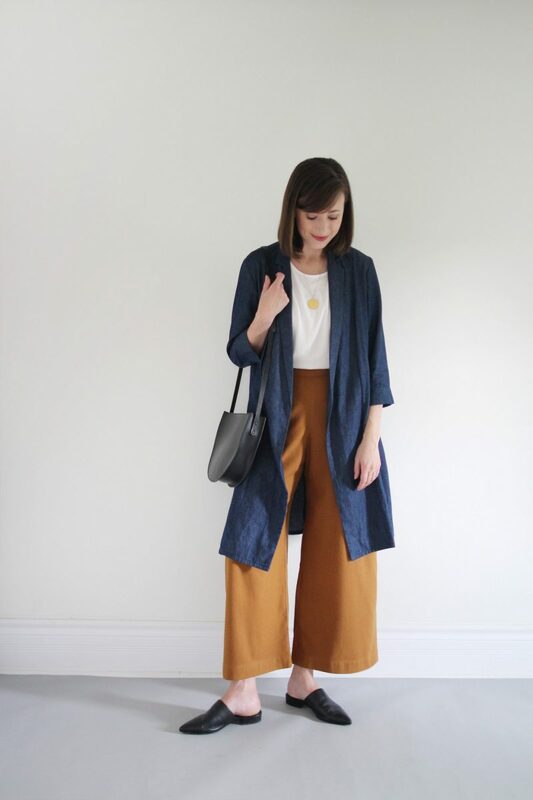 What are the things you didn’t love enough to wear much (if at all)? This way you can avoid repeating old habits. WHAT ITEMS DID NOT GET WORN DURING THIS SEASON LAST YEAR? WHAT SHOULD I DEFINITELY NOT BUY? Now that you have an idea of what you didn’t get much use of and, alternatively, what you would have liked to have, it’s time to make yourself a wish list. I swear by short and thoughtful wish lists and always have one going for each season. They really help to keep me on track with both my spending and personal style and deter me from any impulse shopping. I’ll be sharing my 2019 Spring Wish List next week! Most seasonal collections will have started launching by now so it’s a good time to note the designers/items you love. That way you can save your budget before getting distracted and buying things you might later wish you’d passed on. I tend to hold off until I’ve seen what a few of my favourite brands have cooking before committing to anything. If that means I miss out on certain item, that’s okay! 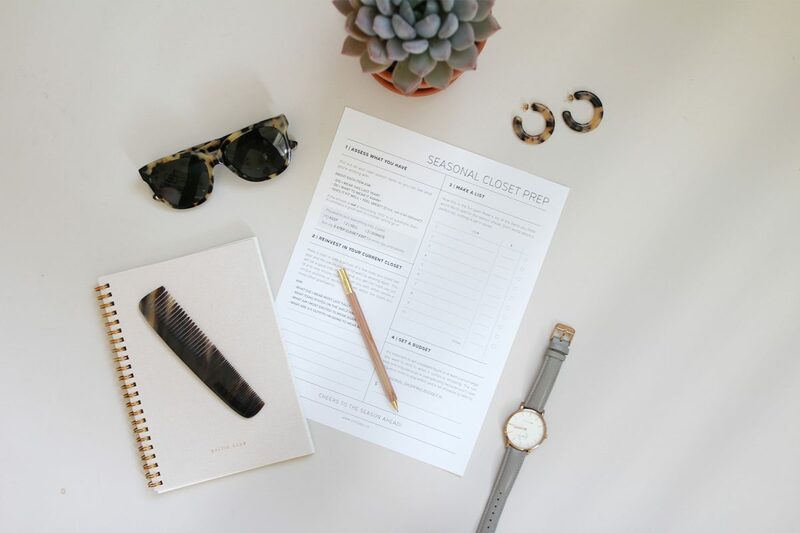 The final step in your seasonal closet prep is to set a budget or a price range you want to stick to when it comes to shopping. This can help limit impulse buys or overspending because you’ll have a figure in mind to stay within and a list of pieces to refer to (thanks to your wish list!). NOW YOU’RE WELL ON YOUR WAY FOR THE SEASON AHEAD! Avoid adding items that won’t get worn. 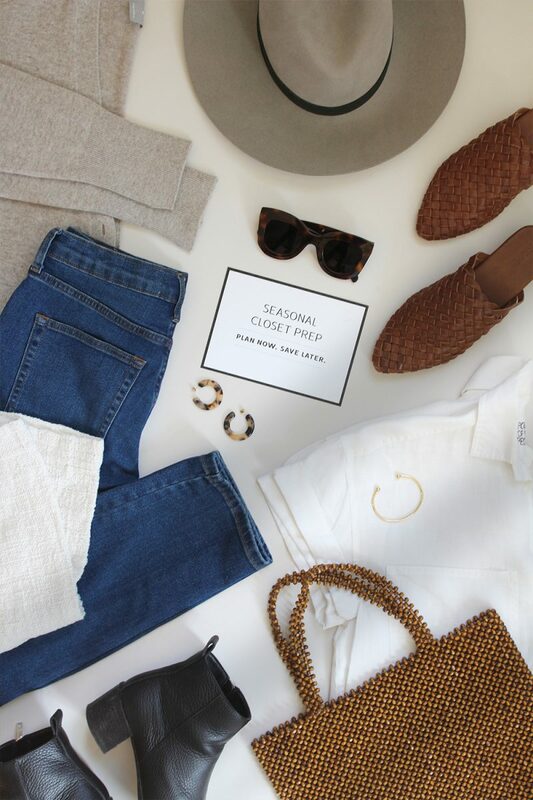 SO WHAT DO YOU THINK, ARE YOU UP FOR A SEASONAL CLOSET PREP? WHAT STEPS DO YOU TAKE BEFORE A NEW SEASON? DID YOU LEARN ANYTHING FROM LAST SPRING? I’d love to see some examples of things that you decide to sell/donate and the thought process behind letting go pieces that aren’t serving you. It seems like it is so easy to convince ourselves that we may need that piece in the future, or that maybe we’ll have the right lifestyle for a given piece at some point, but that mindset can impede the editing process. Now that you are mainly doing maintenance, it can be even harder to make those decisions, and it would be an interesting perspective to see the “behind-the-scenes” of a closet edit. Maybe seeing a “keep” and a “going” item next to each other (especially if those items fill a similar closet niche) would be a good way to contrast! Thanks for the comprehensive process of how you sort your next season wardrobe. And the free download is great, this is just what I have been looking for, thanks again! So nice to read about others who love to do a clean out of their closet at the beginning of the season. I already started a few weeks ago, I was so tired with the winter weather…. I got rid of several items that I bought only 1 or 2 seasons ago (a real bummer) so this year my approach is different. My mindset right now is that I don’t buy anything if I’m not 300% convinced about the item. So when I have just one minor doubt I don’t buy it, instead of telling myself that it will work out fine. I have also given myself a small monthly budget that I can spent every month or save up for something more expensive. This year I will also have extra budget for clothing on 2 occasions and I have already ordered the t-sweater because it was on sale. This approach has given me more clearity and tranquillity in my life and I find it very easy to hold on to. So helpful. So clear and creative. Thank you! Do you part with pieces that “could” still work but do not “spark joy” ? I hesitate to let go in case I cannot afford a new piece or cannot find one. Seems fearful to get to the point of having only a few basic pieces; maybe time to start mixing the pieces and the accessories to create looks. You do it so seamlessly! Thanks Patricia! That’s a really good question. It’s totally fair to be concerned about letting go of pieces that ‘could’ work. If you’re not ready to part with something then hang on to it and give it another chance. Try wearing it as soon as you can and let that decide whether it’s a keeper for the long term. Alternatively, if you find you don’t wear it and it ends up in the maybe pile again the next time, it’s probably not something you’ll miss. Thanks Ryal, I’m so glad this one is helpful right now. That makes sense that you wouldn’t need to edit as often living in a more temperate climate. That’s a good budget question. I don’t have a perfect system for budgeting and being self-employed it can be a little hard to predict. I’m also in a unique position with my blog as opportunities to partner with brands can lead to new pieces being more accessible. I usually try to set a quarterly budget and will watch for seasonal sales. Sometimes I won’t end up buying something on my list if it sells out or is too much of a budget stretch and that’s ok. I like to make a note towards the end of a seasons of the pieces I wished I’d had and will refer to this when the time comes back around and see if it’s still on my mind. 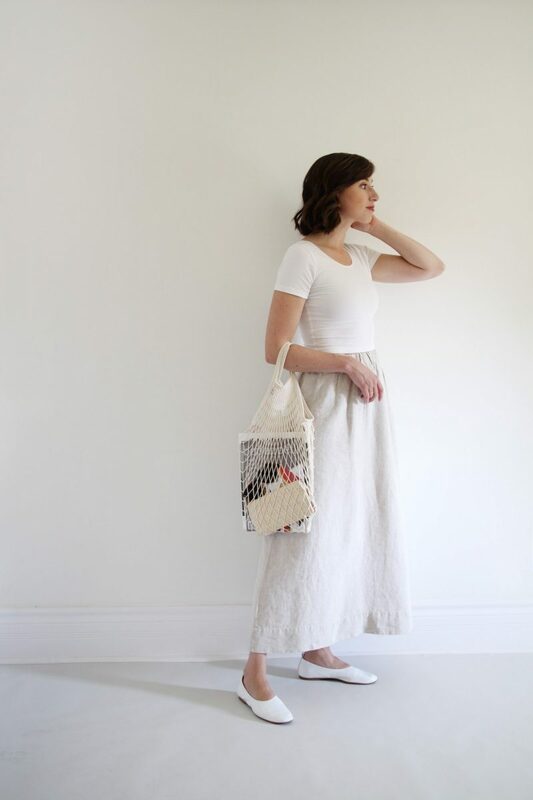 Your approach to your wardrobe is so incredibly thoughtful and methodical. I try to keep my wardrobe as small as possible which makes it a lot easier to edit each season. Thanks Sarah! Can you tell I’m a bit of a control freak 😛 Hope you’re having a great weekend! Very thoughtful and helpful as always. I was wondering–when in the year do you do this? Is it well before it actually gets warm enough to wear the clothes, or when you’re actually switching out your winter closet? 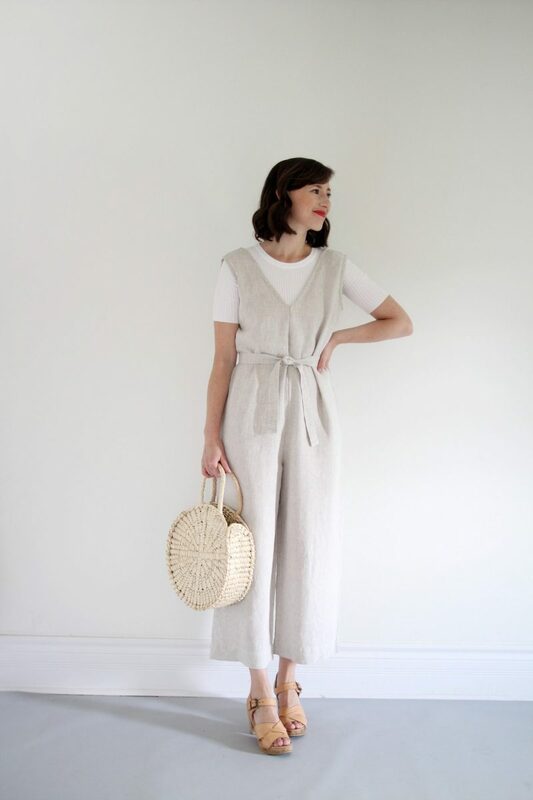 Because living in Ontario I find that spring clothes are being sold well before I can actually wear them, and I can’t resist making plans for when the weather is warmer. But at the same time it seems like a lot of work to take everything out only to put it away again. Another great post – whilst I don’t have quite the same process as you, I do make a vision board and seasonal wish list using Pinterest & Powerpoint. 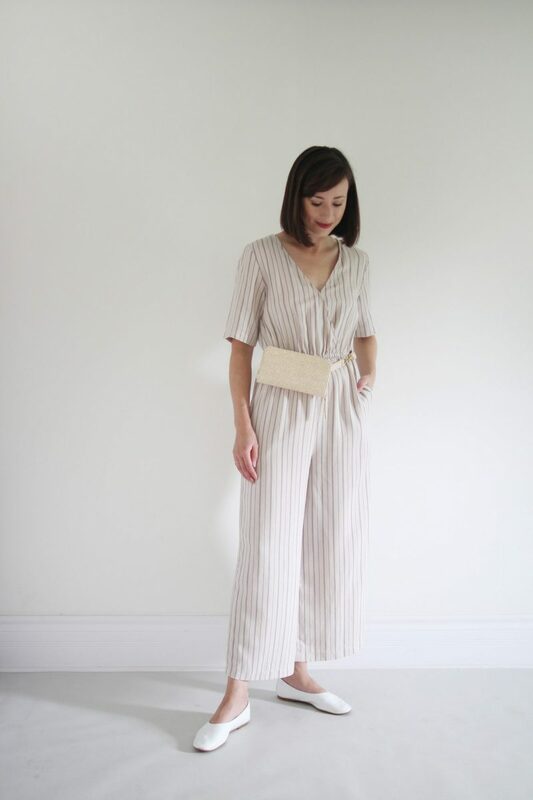 I started doing this four years ago and have noticed a significant drop in the number of wish list items each season because I have been slowly curating my wardrobe (I largely have you thank for this). 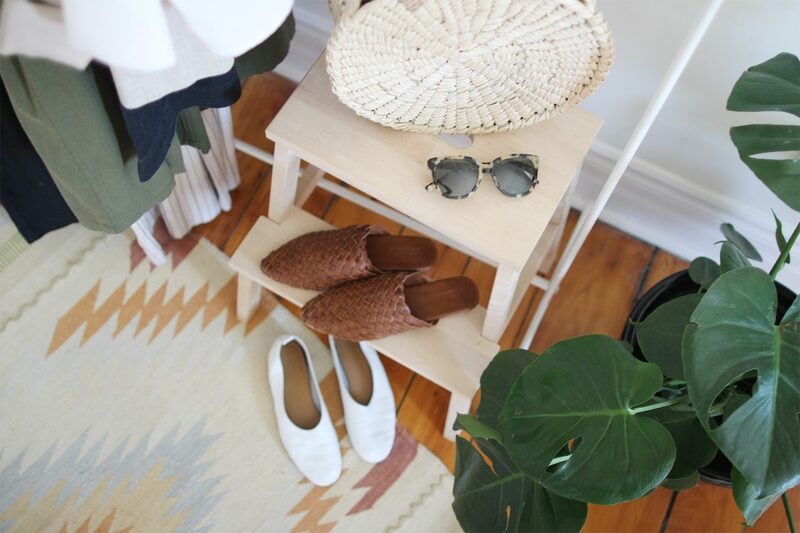 That being said, the number one item on my S/S wish list is the St. Agni Bunto woven loafer – honestly, I am so dang excited to get my hands on them. I can’t wait to see your upcoming wish list. Thanks Jennifer! Your process sounds like it’s working great for you, which is awesome! I use Pinterest a lot for inspiration too, it’s the best. I noticed that those St. Agni mules are darker than the ones I’ve seen here before (and which I also have). Do you have both colors? The lighter ones seem more spring-like, so I was a little surprised to see the Vintage Tan ones in this post. Also, just wanted to mention that I put a couple of your phone wallpaper photos on my phone a couple weeks ago and LOVE them. Thanks for that little treat! So glad you love your wallpapers Devon, thanks for letting me know! Yep! I bought the Vintage Tan this spring while I was in Vancouver. A shop called Vincent Park carries St. Agni and I couldn’t seem to get them off my mind. Loving how the darker tone works with my closet. I still have the Almond colour so I’ll see which I reach for most. They’re such a great spring shoe!